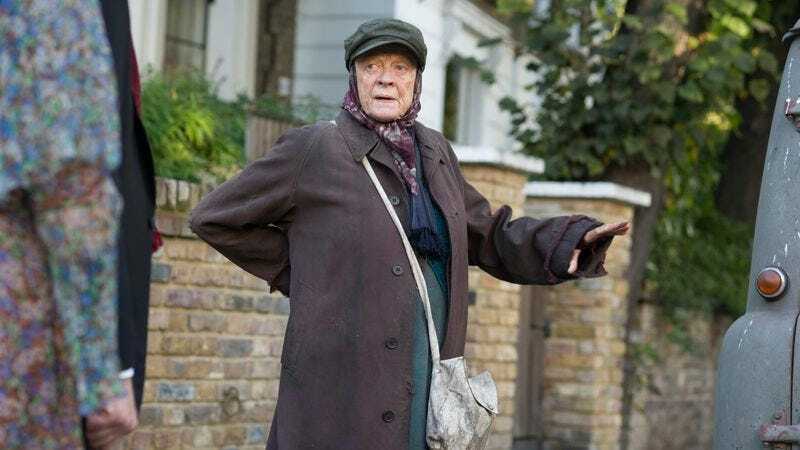 Dame Maggie Smith’s bitter, deathless rivalry with her Best Exotic Marigold Hotel costar Dame Judi Dench reaches another milestone with The Lady In The Van, where Smith, presumably seething with jealousy over Dench’s opportunity to play an elderly woman whose life has been ruined by the Catholic Church in Philomena, plays an elderly homeless woman whose life has been kinda-sorta ruined by the Catholic Church, albeit in a more genteel fashion. As in Philomena, the woman in question remains faithful to her chosen religion despite the ways the institution has wronged her—and as in Philomena, any disbelief over this situation is supposed to be mitigated by the film’s basis in fact. Which is to say that, yes, Miss Shepherd (Smith), an English woman living out of a series of decrepit vans, really did take up residence on the Camden Town street of playwright Alan Bennett (Alex Jennings)—and then, eventually and for 15 years, in Bennett’s driveway. This act of kindness is never particularly acknowledged as such by Shepherd, who is generally averse to any expressions of gratitude. She is also unembarrassed about her homelessness, hardly considering it normal vagrancy as she boasts of her (demonstrably absent) cleanliness, noting that she was the “cleanest of all my mother’s children.” Like Dench’s Philomena, she appears to do as she pleases, how she pleases, when she pleases, despite her life’s clear limitations. She and Bennett do not become friends, exactly, but as he observes in the voice-over presumably nicked from his real-life memoir of the same title, she stays on the periphery of his life long enough to become a significant part of it. Bennett’s life is conveyed on screen by the use of two on-screen Bennetts, both played by Jennings: one who experiences his life, and the other who watches, takes notes, and sometimes converts it into fictionalized writing. The two Bennetts occasionally chat with each other mid-scene, lightly bickering about how their life and work fit together. It’s a clever idea, which the movie proceeds to explain multiple times with boldfaced lines like “I live, you write—that’s how it works.” The tentative and sometimes difficult relationship between Bennett, Shepherd, and the rest of Bennett’s life is interesting, but lines like that turn the movie’s thematic concerns into a series of grinds. In addition to the fiction/life divide, there are parallels, endless parallels, between Shepherd and Bennett’s ailing mother, and the ways he finds himself needing to care for both of them. The dangling of Shepherd’s mysterious backstory over the proceedings rounds out the movie’s bag of tricks, though few of the revelations pack much surprise, punch, or emotion. The backstory is where Shepherd’s Catholicism comes into play, but it reveals as little as anything else. 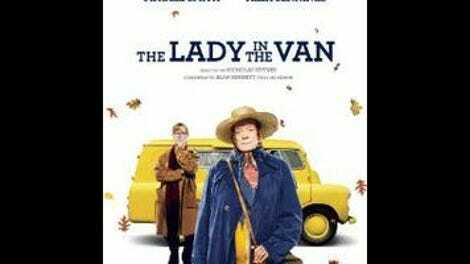 By design, though, The Lady In The Van is supposed to be revealing Bennett, not Shepherd (and anyone who misses this fact will be reminded of it before the film’s end). That design seems flawed when it becomes clear how much more commanding Smith is, even in her character’s dotage. She exchanges her usual air of dismissive authority for a dottier form of imperiousness—though set in her ways and beliefs, Miss Shepherd appends many of her more outlandish statements with “possibly,” like a rhetorical trick to make herself sound less obstinate. Jennings, nasal and tweedy, honorably tending to his character’s quiet, semi-closeted homosexuality, doesn’t have a chance, no matter how many meaningful considerations of mortality the screenplay throws his way. At one point, Bennett is shown performing one of his works—a monologue—on stage (an odd detail given that he makes no mention of his experiences as a performer before or after this scene), without much charisma, and that’s what the film often approximates: the feeling of a pithy, dry, slightly philosophical monologue delivered competently but without much flair. Though director Nicholas Hytner does his best to enliven the material, Bennett very much comes across as a dull man’s Charlie Kaufman, even more so when the movie ends with flat, unearned whimsicality. Good as she is here, Smith must cede this round to Dench.